This is for my nephews Mario, and Jayden who are two little cuties. Mario lived with me for 6 months and I miss him dearly! Last Easter all he was interested in were the eggs! 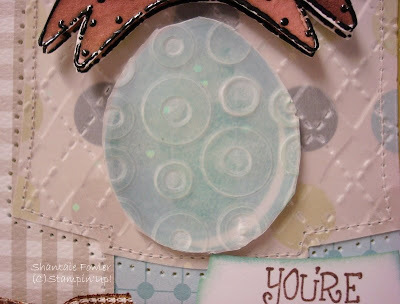 This card happens to combine a couple of different challenges, one is from our creative corner the plan is to use your favorite Easter stamp set....this egg is actually one of my favorites of all time its from Stampin' Up! named eggcitement. This great sketch is from stamps and smiles be sure to check it out and play along. At cuttlebug challenge we are to use velum in our Easter project. I ran my DSP and my velum through the embossing folder at the same time, I really like the argyle pattern on the polka dot paper. I stitched the nestie label and pierced around the edge. Kiwi base with stitched layers of DSP, the nestie label embossed with argyle folder. The sentiment was stamped and cut out with smallest nestie label and hand cut to size, then the edges were sponged. the bunny was embossed then water colored and popped with dimensionals. The egg was treated the same way as the label then sanded. Hi Shantaie - your Easter card is darlin'!!! 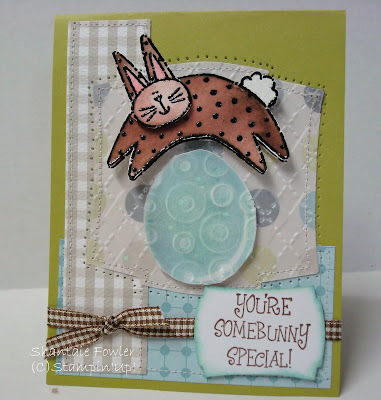 Love the different textures and the sweet bunny!!! this is precious....the boys will love it! thanks for playing along with last week's sketch, and i hope to see you again this week! What an adorable card! Great job doing that many challenges in one! You did great with the vellum and I just love your Easter bunny, too cute. absolutely PRECIOUS, love that bunny!!! I so look forward to seeing your cards every week Shantaie! This one is fabulous...the vellum just softens everything! Thanks for playing along this week at the Cuttlebug Challenge Blog! This is really too adorable!! Love the cute bunny jumping over the egg! Your embossing looks fabulous as well! Great job with Be Inspired 26...thanks for joining us at the Cuttlebug Challenge this week! Oh, wow! You did a terrific job! I love your hoppy bunny!